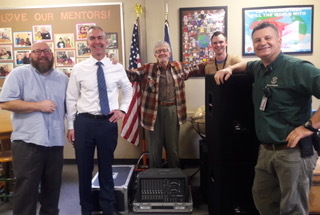 Boise Blues Society Donates Unused Sound Equipment to Taft Elementary School! Boise Blues Society, as a part of its mission to support music education in the schools, recently donated unused sound equipment to Taft Elementary School in Boise. BBS is proud to be able to support music in the schools and knows that Taft will make good use of this sound equipment. Our Official BBS FaceBook Page connects you with a community of blues lovers from the Boise area. Find out about upcoming events, see photos and videos from recent shows, hear great blues recordings. Like us today! Get ticket and merchandise discounts, and help us spread knowledge and appreciation of blues music throughout the Boise area! Join us today. We know your time is valuable. Want to support our work? Simply click here to donate any amount you choose. Over the past year, with your support, the BBS has provided children in 13 area elementary schools with presentations including a live blues mini-concert exposing and educating them to the history and development of blues music in the USA. BBS, in 2018 also has awarded three $500 scholarships to aspiring, local youth interested in pursuing their passion for blues music. With your support, BBS, has produced 6 shows with nationally known Blues Artists, including several nominated for awards by the Memphis-based Blues Foundation. And, with your support, BBS has produced 23 shows with local bands at the Sandbar, and hosted 10 jam sessions for all local blues musicians, and showcase blues bands debuting their music at the Playhouse Boise. During 2018, BBS also produced several benefit shows highlighting local bands and benefiting the community, as well as the BBS, including the Wipe Away the Blues Festival at the JUMP Center, Fat Tuesday, and the Winter Blues Festival. Yes, BBS needs your continued support. Please join or renew your membership to help us continue to impact the Boise community with the Blues! More great things to come! Stay tuned…. The bands on this list are not endorsed by the Boise Blues Society (BBS), but have been vetted and played blues music at BBS events. All of the bands listed below have assisted the BBS by playing in our benefits and/or have hosted jam sessions as a showcase band, thereby promoting the mission of the society. Their contribution to the Boise Blues Society is greatly appreciated. If you have a blues band that is not included on this list, please contact Bill Arnold at drbilrnold@gmail.com for information about what your band needs to do to be vetted by the BBS Events Committee for a listing here. Our intent is to support local blues music and the local bands that promote it. The list will be included to assist selection of local bands for BBS produced events and also posted on the BBS social media as a resource list for local venues looking for bands. The Boise Blues Society has partnered with the Riverside Hotel for our second year of Tuesday Blues Evenings at the Sandbar. Check out the Tuesday schedule. Come and enjoy these free shows with local blues bands. Enjoy a relaxing evening Sandbar next to the Boise River. Spreading knowledge and appreciation of blues music throughout Southern Idaho. The Boise Blues Society, a 501(c)(3) nonprofit organization, brings the blues in all its forms to fans of all ages throughout the Treasure Valley. We use the American art form of blues music to develop our youth, build our community, and strengthen our economy. Contact us at 208-440-4590 or PO Box 2756, Boise, Idaho 83701 or email boisebluessociety@gmail.com.